Nature’s signals are changing American minds about the risks of climate change. But Washington’s minds are lagging, despite President Obama’s stirring call to action in his inaugural speech. The best hope for achieving the transition to a low-carbon economy is through innovation to reduce the costs of new energy technologies. Energy markets left to themselves will discount climate-change risks, so public action to encourage these innovations is needed. But public action does not mean putting government agencies at the center of the innovation system. Instead, the focus should be on unlocking the immense creativity and resources of America’s private entrepreneurs, investors, producers, and energy users. The debate in Washington on how to do this has featured two and a half ideas — from Democrats, Republicans, and economists. The economists’ big idea has been to attach a price to carbon emissions. That idea has intellectual merit but lacks congressional support. And it would only be a partial solution. The Democrats’ main idea has been to do more of what we’ve been doing already — tighter federal standards and regulations on fuel use and carbon emissions, and a bulked-up Department of Energy to prime the energy innovation pump. These actions would fall far short of what’s needed. The Republican Party’s half idea has been that climate change is a non-issue. Beyond this, the GOP has largely been absent from the debate. That is unfortunate, because another idea dear to Republicans — limiting the federal government’s reach — may hold the key to the energy innovation challenge. While Congress flounders, many good ideas for advancing energy innovation are hatching at the local and state levels. Might the states act as “laboratories of democracy,” with the best ideas eventually picked up by the federal government? Unlikely. With fiscal imbalances stretching to the horizon and congressional dysfunction endemic, the chances of Washington implementing any major new initiatives seem remote for the foreseeable future. A better option is for states and regions themselves to serve as the “arsenals of innovation” in the war against climate change. “War’’ and “arsenals” are not words to use lightly. But let there be no mistake: The scale of the effort required will be comparable to America’s huge commitment to national defense. So why a decentralized approach to climate change when this would be unthinkable for national security? There are three good reasons. First, much about how America produces and uses energy will need to change, and this will affect almost everything each of us does, every day. You don’t have to be a libertarian to dislike the prospect of federal intrusion into daily life on that scale. 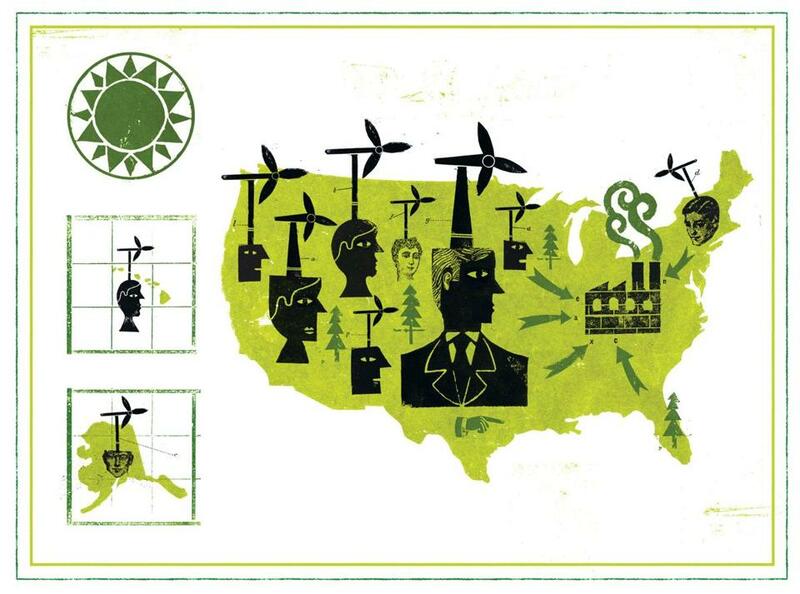 Second, America’s regions have vastly different energy priorities. Previous congressional gridlock over energy issues resulted less from partisan politics than from deep regional divisions between politicians of both parties. In the great low-carbon energy transition ahead, the biggest economic losers will be the powerful fossil fuel industries and the communities that depend on them. With Congress in the driver’s seat these interests will first obstruct and then demand compensation as a pre-requisite for action. A decentralized innovation strategy would avoid delay by accommodating the growing desire to deal with climate change in some parts of the country, even as others prefer the status quo for now. How would decentralization work in practice? In the coming decades the greatest need is for hundreds of billions of dollars of risk capital to finance innovative carbon-reducing energy projects. Private financiers won’t fund this alone, partly because of apprehension over unstable federal policies. Climate-yes states can help fill the gap, with revenues from an innovation surcharge on retail electricity prices, which states mostly determine. State trustees would allocate these funds competitively to a national network of regional venture investment banks led by experienced, knowledgeable investors. Their investments would leverage larger amounts of private-risk capital for innovative carbon-mitigating energy projects. California and the Northeastern states, already showing the way on other aspects of climate policy, might be charter members of such an innovation network. More states will likely join as they become convinced of the environmental need and economic opportunity. The federal government still has a crucial role in funding basic energy research. But for downstream innovation investments it’s time to bypass Washington. That’s how to unlock America’s enormous entrepreneurial, managerial, and financial capabilities to meet one of the 21st century’s greatest challenges.